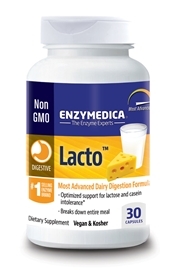 Lacto is formulated for those who have difficulty digesting foods that contain dairy. Prevents gas and bloating, complete digestive support for cheese and milk digestion. Most likely you are having trouble digesting the milk sugar called lactose. Between 30 and 50 million Americans are lactose intolerant.1 Lactose intolerance is a condition caused by an insufficient amount of lactase. Lactase is the enzyme in the small intestine that digests lactose (a dairy sugar). Normally, lactase breaks lactose down into galactose and glucose that can be easily absorbed into the bloodstream. When there is not enough lactase to digest the amount of lactose consumed, water is retained in the bowel, which results in bloating and diarrhea. Lactose that passes into the large intestine is fermented by bacteria. This produces carbon dioxide, hydrogen and methane, which may lead to bloating, cramping and gas. Some causes of lactose intolerance are well known. For instance, certain digestive diseases and injuries to the small intestine can reduce the amount of enzymes produced. In rare cases, children are born without the ability to produce the enzyme lactase. For most people though, lactase deficiency is a condition that develops with age. After about the age of two years, the body begins to produce less lactase. However, many people may not experience symptoms until they are much older. Symptoms of lactose intolerance include occasional bloating, cramps, gas and diarrhea. These discomforts usually occur thirty minutes to two hours after ingesting lactose containing foods. The severity of symptoms usually depends on the amount of lactose ingested and how much of the enzyme lactase remains in the intestinal tract. Take 1 capsule of Lacto at the beginning of each meal that contains dairy. More may be taken as needed.